These web pages deal with what I call the Perry Expedition (Perry Expedition Lithographs) lithographs (tinted / chromo-lithograph plates). 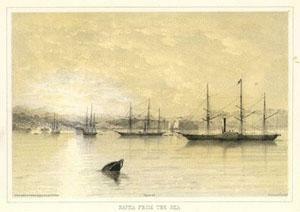 In specific, the lithographs that were incorporated into the Narratives of the expedition published in 1856 and 1857. There were other lithographs published in the 1850's, or perhaps later, regarding the expedition, but they are not the focus of these pages. Unless stated otherwise, all the lithographs on these web pages were actually bound into Volume 1 or 2 of the US Government Narrative published in 1856 and 1857. The lithographs did not have page numbers. They were bound into the book and not loose. The horizontal (landscape) format lithographs were generally (but not always) bound with the bottom of the image/picture toward the spine of the book. 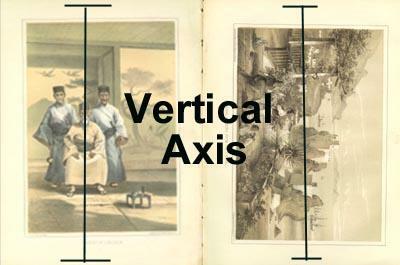 The vertical (portrait) format lithographs were bound in with either the right margin or left margin toward the spine. When a lithograph is taken from the book there generally is paper adhering where it was bound to the spine of the book. This is one condition that can be used to help authenticate a lithograph. You often find the lithographs trimmed on one side to remove the unsightly spine area. Page Size. These lithographs come in various page sizes. I break these down into three basic categories. The page size of lithographs from the Beverley Tucker (Senate printer) edition is approximately 23+/-cm (short - horizontal axis) x 29+cm (long - vertical axis) [ca. 9 x 11 1/2 inches]. In the book trade, this is referred to as "4to". The page size of lithographs from the AOP Nicholson (House printer) edition is approximately 22.2+/-cm (short - horizontal axis) x 29-cm (long - vertical axis) [ca. 9 x 11 1/2 inches - a shade smaller]. In the book trade, this is also referred to as "4to". The page size of these lithographs (unknown edition) is approximately smaller >21.6 cm (short - horizontal axis) x >28.5 cm (long - vertical axis) [ca. >8 1/12 x >11 inches (approximately the size of a letter size sheet of paper)]. I have not been able to attribute these lithographs to a specific book. However, I believe that they result from trimming in the process of rebinding the books (Tucker or Nicholson). Obviously, they could also result when individuals decide to reduce the size of lithographs for whatever reason. I have never seen lithographs of this size actually bound into an un rebound Tucker or Nicholson book. All copies of small format lithographs I have examined had already been removed from the source book. For more information on page size lithograph by lithograph click here. On this page I have recorded measurements on many of the lithographs I have examined. In addition to page size, the above web page lists the image area and various types of the lithographs. There are many lithographs with different image areas and a few with significant differences in the actual image or the titling on the lithograph. For a reason why the lithographs may have slightly different images, read on down or click here. Rebound Books & Trimmed Plates. It is my experience that a great number of Volume 1 of the Narrative have been rebound over the years. Based upon what I have personally seen, my estimate is at least 25%-30% of the books have been rebound. I would estimate a lesser percent of Volume 2 have been rebound and an even smaller percent of Volume 3. Rebinding ranges from quality leather rebinding by craftsmen to rather crude marble board products. I believe that in rebinding, some book binders would trim down the pages. This would remove the dark stain (foxing, toning and just plane dirt) that naturally accumulates on the exposed page edges. It would also remove a certain amount of margin flaws such as small tears, foxing, water stains, toning etc. I do not consider "minimal" trimming a defect either in a rebound book or an extracted lithograph. Minimal is a subjective term. I define minimal as less than 1 cm loss of plate size, vertically or horizontally. Obviously trimming would not be minimal if it cut away text or image area of maps or lithographs. Margins vary significantly (margins as they relate to the lithographic image area on the plate). They are generally not equal. The margin toward the lettering/title on the portrait type lithos is often significantly larger than the opposite margin. It should be noted that the margin toward the spin (short -horizontal - axis of page) is often trimmed 5-15 cm because it is so rough. While I personally prefer untrimmed lithographs, I personally would not consider that a negative factor as long as the length (long - vertical - axis of page) of the page is undisturbed (not trimmed also). Large format lithos tend to have a spine margin with paper adhering ranging from 5-12cm. The paper adheres in an irregular manner. The medium format lithos tend to have a smaller (4-6cm) area where the paper adheres and the paper adheres in a uniform manner. The small format lithos do not have paper adhering. While the lithographs could be cut down, it might be a good idea to avoid those that are smaller or only purchase them at a discount to a full size lithograph. It is my opinion that, as a general rule, lithographs that are in the paper size range of 23cm x 29.25cm (9 x 11 1/4 in) are from the original Narrative. Paper Thickness. The paper on the lithographs is thicker than the paper used for the text pages of the book. I would not call it thick paper but it is fairly rigid. I have found the large format lithographs with a paper thickness of 6-9mm. The average large format litho is in the 8mm thickness range. The medium format lithos seem to generally be slightly thinner with a range from 6-9mm but with thinner (6-7mm) being the norm. The paper on the smaller formats lithographs generally is 9+mm. When you hold any of the lithographs horizontally by a bottom margin, they are thick enough to remain rigid and not bend. The image area is almost always (there are several exceptions) bordered by a thin line box frame. The dimensions of the box vary by lithograph but are in the general range of 15½-16 x 22½-23cm. When describing the image area, I will provide three measurements. Length "L", Width "W" and Diagonal "Diag." The diagonal measurement is made diagonally across the box (image area where no box frame) from one corner tip to the one diagonally across from it. An example would be -- L:W-15x23cm, Diag-29cm. Left Side (inside image box): Artist: (Heine or Brown generally). Right Side (inside image box): Company producing the lithograph. Middle (inside image box): A few lithographs have a name and then "Del" next to it in the middle inside the image box. Del (Latin, deleavit) literally means "He (she) drew it." Bottom Middle (outside image box): Title of the lithograph. a. The Mechanical Process of Producing Lithographs. The design is drawn or painted on the polished, or grained, flat surface of a stone, usually Bavarian limestone, with a greasy crayon or ink. The design is chemically fixed on the stone with a weak solution of acid and gum arabic. In printing, the stone is flooded with water which is absorbed everywhere except where repelled by the greasy ink. Oil-based printer's ink is then rolled on the stone, which is repelled in turn by the water soaked areas and accepted only by the drawn design. A piece of paper is laid on the stone and it is run through the press with light pressure, the final print showing neither a raised nor embossed quality but lying entirely on the surface of the paper. b. Tinted Lithographs. A tinted lithograph is one where one or more "ground" or "surface" tints, are used in conjunction with the black outline of the picture. The tint gives the resulting illustration a watercolor-like tone. To produce a tinted lithograph, the design is divided among several stones, properly registered, to produce, through multiple printings, the tinted lithograph. Generally, the tinted lithographs were produced from 2 or 3 stones, one producing the details of the image in black ink, and 1 or 2 others providing some wash/watercolor-like coloring (typically yellow, fawn, blue or gray). The majority of the lithographs we are talking about here were produced with this multiple stone tinting process. Here is an example of a tinted lithograph from the Narrative. The primary lithographers for the tinted lithographs in Volume 1 of the Narrative were Peter S. Duval and Thomas Sinclair. The Duval plates generally use shades of brown as a tint while the Sinclair plates used green and brown tints. c. Chromo-Lithograph. A chromo-lithograph is generally rendered in striking colors as opposed to the tinted lithograph which has a general overall color. In this process the separate stones are prepared to render specific colors. Several different stones may be used to get the vivid multicolor image. Here is an example of a tinted lithograph from the Narrative. e. The Process. The first step of the lengthy process to create a new lithograph, began with the lithographic artist who mentally broke down the design into its individual colors using a key-line drawing. Next the stone was carefully cleaned and polished with a thin solution of gum arabic in dilute nitric acid, which was then washed off, leaving a thin film of the gum in, rather than on the stone, thus making the entire stone's surface now impervious to grease. The design having been traced from the key line sketch was then scratched (engraved) in the film of gum using sharp pointed steel tools. Engraving the stone was a very tedious process, as practically all of the work had to be done with great care under a magnifying glass. Engraved lines were made very shallow, the aim was to cut only through the prepared gum surface, which was very thin. This would uncover the absorbing qualities of the stone at these points, and then the stone would take ink. Water was applied to the limestone and absorbed by the etched sections of the stone. Printing ink for each color was applied, and colored ink adhered only to the image on the stone. Damp paper was then pressed to the stone and an image was produced in the color represented by that stone. The same process was repeated for each color in the design with the lithographer carefully registering the same piece of paper on each separate stone. Each separate color used in the image required a stone for that color. On a good day thousands of these lithographs could be produced. f. Variations in the pictures. Numerous minor variations in the pictures on these lithographs have been noted. I believe a couple of factors cause these variations. 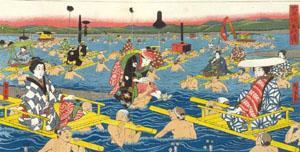 According to The Great Loo Choo Discovered, 19th Century Ryukyu in Western Art and Illustration by Rob Oechsle, it is possible (not confirmed however) that some or all of the lithographs were completed from a single sheet that was pressed against multiple lithographic images aligned 1x1 or 2x2 etc. The single sheet was then cut to make the lithographs for the narrative. This would mean that multiple lithographic stones would be engraved with the same picture. It is very reasonable to find minor variations in the image picture and titles in the finished product. This initial multiple stone situation is compounded because tinting process would require yet another set of one, two or four lithographic stones. Lithographic stones are subject to deterioration and could have required replacement. The Bavarian limestones used were 3 to 4 inches thick and approximately 8" x 10" inches in area. They were heavy and hard to handle and broke easily. The complicated process (hand drawing the picture onto the stone image and physically making the lithographs) and fragile nature of the stones could have required stones be replaced and the image on the new stone might have variations from the one it replaced. Clearly these lithographs were produced from more than one hand drawn stone. Add to that the fact that 10s of thousands of each lithograph were produced for the Narratives and the possibility for variations is to be expected. While the basic overall image will be the same, minor variations are the norm. Even using the same stones, variations in color and intensity occur depending on the inking of the stone and the manner it was pressed on the stone. g. Prior to the lithographic method of creating color illustrations, the acquaint process was the most commonly used. Aquatint is produced by dusting the copper plate with a resin and heating the plate. As the grains of resin melt, they produce an irregular pattern of a dark network surrounding small white patches of resin. When acid is applied to the plate, it will etch only the spaces around the resin, resulting in an overall textured pattern. Watercolor was then applied over the printing to achieve the colored image. Aquatint came into use in the mid-eighteenth century and was used extensively from the 1770s until the 1830s. This process was not used in the Narrative. h. Steel/Copper Plate Engravings. In volume 2 you find steel/copper plate engravings. Some are black and white (animals) and some have been hand colored (shells). This is the process of producing illustrations by creating incised designs on a metal plate with a cutting tool called a burin. At the beginning of the 19th century, the copper plate was used instead of steel and that process is called copperplate engraving. Another term for the process, line engraving, derives from the fact that this technique reproduces only linear marks. Tone and shading are suggested by making parallel lines or crosshatching. The incised plate is covered with ink which is then cleaned off. When the paper is pressed firmly on to the plate it only receives impressions from the engraved lines, the ink having remained in these after being wiped off the surface. The un inked surface then appears as white areas on the resulting print. This is a tedious process executed by hand. Un printed parts surrounding the design. Margins were usually clipped until the eighteenth century, and from the beginning of the nineteenth their existence came to be regarded as an important factor in assessing the commercial value of a print. If clipped, the impression would be worth less, particularly if printed on fine quality paper. Facsimiles of the Perry Lithos may exist. I have not confirmed any but this possibility must be considered. A print which is an exact copy of an original design, i.e. a "reproductive" print as opposed to an "original" print. In a more specific sense, facsimile refers to the exact reproduction of a line drawing in wood engraving (as opposed to its interpretation in a brush or wash technique) and was particularly popular in the nineteenth century. Photomechanical processes are also used for obtaining facsimiles. Color (Tinted) Printing versus Hand-Coloring. Color (Tinted) Printing. In offset lithography and photogravure several blocks/plates are also used: there are three if the base colors, blue, red and yellow, are used (by over printing different colors can be obtained), or four if grey or black is added to emphasize the dark areas. Printing with different colored blocks, plates or stones demands exact registration involving a careful concordance of the variously colored parts. Usually colors are printed from light to dark but often the blues are printed first. Hand-Coloring. Hand-colored prints have an old tradition and must be distinguished from those printed in color (tinted). Coloring is done in watercolor or gouache, with either a brush or a stencil cut to allow ink through over the necessary areas directly onto the impression (as opposed to the block, plate, etc). I have not seen these lithographs hand-colored but since it is a relatively simple process, it may well have been done to "enhance" the appearance. Personally, I would consider a hand-colored print of one of these lithographs to be worth less than one in the original state. To create a wood engraving, the artist would first draw his illustration on the surface of a very hard block of wood. Then the engravers carved into the wood to produce an original engraved block from which plates were made for printing the artist's images.